We also use PDT for treating inflammatory acne lesions not responding to conventional treatments. Photodynamic therapy is an outpatient procedure and does not require a hospital stay. It may be used in conjunction with other treatments like fractional skin resurfacing to deliver superior clinical results. The treatment begins with the topical administration of a photosensitizing agent, on the area to be treated. This drug is absorbed by the skin cells, both healthy and cancerous, but stays in cancerous cells longer. 2 hours after the application of topical drug, specific wavelength lights are administered for 15 to 20 minutes to activate the photosensitizer. Once the drug is activated, it produces a highly reactive form of oxygen which attacks and destroys the abnormal skin cells. How will I feel after the PDT treatment? It is normal to experience redness, swelling or tingling for about 48 hours after your PDT session. Crusting, darkening or lightening of the skin may also occur. Normally these effects pass in 1-3 days, and improve markedly within a week. By this time you will also notice the results of your treatment. 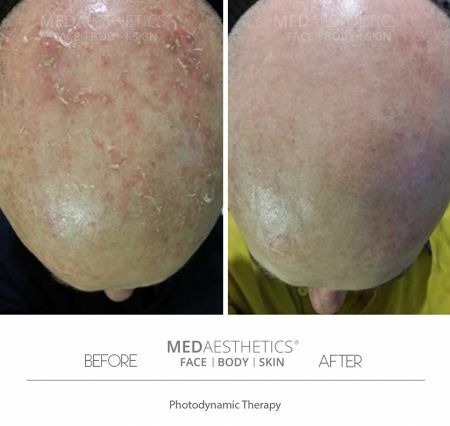 Within 4 weeks of treatment, you will notice much improved appearance of your skin, more natural, youthful and vibrant. What after-treatment care is required? It is important to take care of the treated area immediately following PDT, as it will be sensitive to UV rays. This includes avoiding all sun exposure for the first 48 hours, and avoiding extended periods of direct sun light without adequate protection ( sunscreen, hat, coverage) for about two weeks. Some patients choose to take a day or two off work while their skin recovers, depending on the extent of their treatment. What can be achieved with PDT? The number of dystrophic or sun-damaged cells are decreased leading to an improvement in the texture of the skin and a reduction in the probability that these cells will be come cancerous. It also is very effective in helping to reduce the number of seaceous glands along with the bacteria, propionobacterium acnes, that causes acne. Hence, dramatic improvements in the number of active acne lesions are seen. Particular improvements are seen in those people who have cystic or inflammatory type acne. Benefits are gained not only from the activation of ALA by LED light or IPL, but also from the LED light or IPL light itself rejuvenating the skin.How many sessions are needed? Best results are achieved by two to four sessions at intervals between 10 and 30 days for the treatment of acne. Treatment of solar keratosis, basal cell carcinomas, psoriasis and skin rejuvenation generally requires less treatments at intervals of 4 to 6 weeks ( one or two treatment). People with solar keratosis, basal cell carcinoma, active inflammatory acnes, sun damaged skin can all benefit from PDT. It is not suitable for people who are breastfeeding, pregnant, have history of keloid scarring, Roaccutane use in past 6 months, or have a history of porphyria.